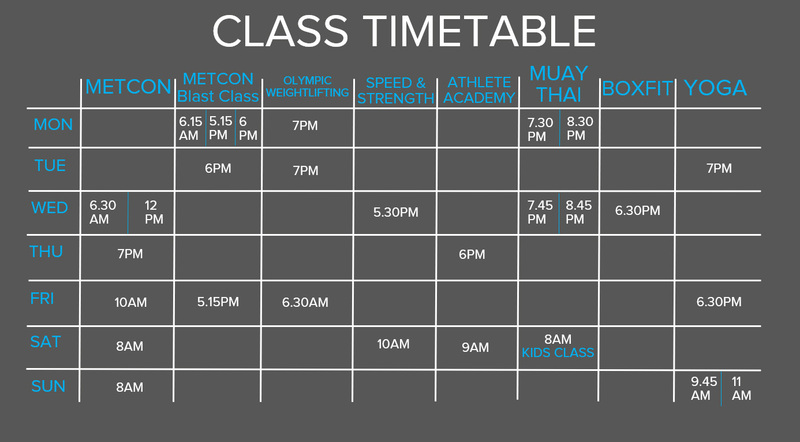 If you’re looking to get fit, make friends and have fun, then our extensive schedule of daily classes are for you. Making the most of our 6,600 sq ft gym, we run regular group exercise classes that are perfect for both pushing your limits physically and broadening your horizons socially. From intense fitness training with BoxFit, Muay Thai and MetCon, to Strength and Conditioning classes, Olympic Weightlifting and Yoga, you’ll find an eclectic mix of fitness classes that are open to all people of all levels. All of our exercise classes are available to members and non-members, so if you’ve always wanted to try Thai Boxing, Yoga or Weightlifting, then come and give it a go! Join a fierce group of women at our ladies only class. Building muscle, working up a sweat and making friends! Perfect for anyone looking to learn how to box and get fit at the same time. A high intensity strength and conditioning class scaled to your individual skill level. One of the most effective and powerful forms of martial art and suitable for all ability levels. The Olympic lifts are an unrivalled method of developing flexibility, strength and conditioning. Come learn and perfect the Squat, Bench and Deadlift under expert coaching. For anyone looking to compete or just get strong. Join us to focus on developing the two main ingredients in an athlete’s performance – Speed and Strength! If you are keen to strengthen and train both the body & the mind, yoga is for you. Open to children aged 9+, our Young Athlete Academy specialises in teaching children how to become faster, stronger and physically literate, well-rounded athletes.